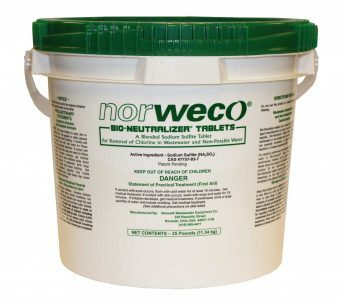 Bio-Neutralizer dechlorination tablets are formulated to effectively remove free and combined chlorine from water or wastewater treatment system flows. Containing environmentally safe sodium sulfite as the active ingredient, Bio-Neutralizer tablets provide consistent reduction or elimination of residual chlorine without affecting water quality, dissolved oxygen or other discharge parameters. Bio-Neutralizer tablets automatically adjust their dissolve rate in direct proportion to the incoming flow rate, to provide consistent chlorine removal up to intermittent peak flow factors of four. When used in any approved gravity flow tablet feeder, Bio-Neutralizer tablets insure the effective reduction of chlorine residual while maintaining overall effluent quality. Bio-Neutralizer tablets are packaged in easy to open, resealable 25 lb. and 45 lb. Department of Transportation approved containers.